At Northwest Pilot Project we are often asked how we define affordable housing. The expression has become so widely used, it is now applied to housing that serves a broad range of income levels. In response to this question we publish an annual update of the income levels of the people we work with and what they can afford to pay for their monthly rent. You’ll find this information listed below. The people served through our Housing Program reflect a broad spectrum of backgrounds, careers, and work histories. We work with people who were bank tellers, nurses, teachers, long distance truckers, custodians, bookkeepers, construction workers, cooks, farm laborers, veterans, waitresses, loggers, and social workers. What they hold in common is that most are now living on an income of $990 per month or less. They are people who worked hard all their lives but did not have retirement benefit plans attached to their jobs, and are now living on limited income from Social Security. 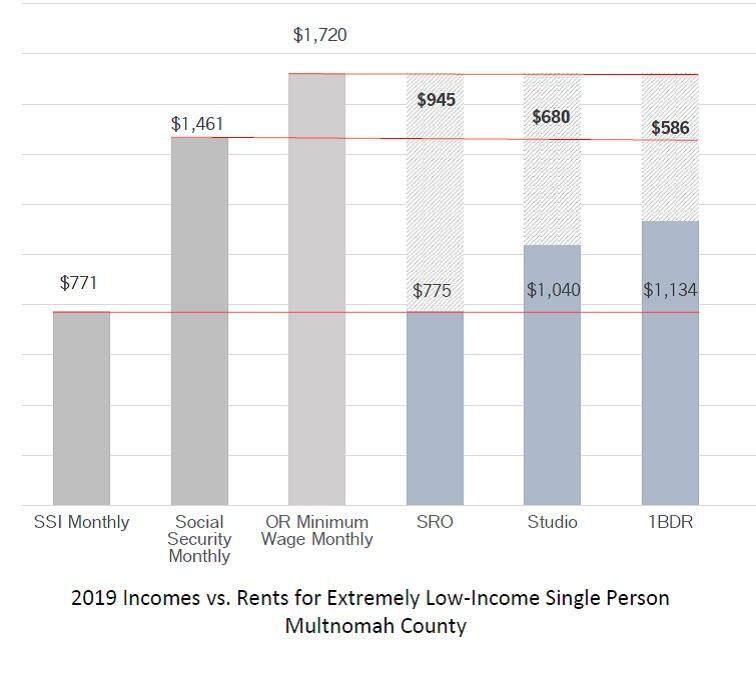 NWPP has started to report on the number of apartments in Multnomah County that are affordable to different income groups. This report is available at nwpilotproject.org The lowest income group – those who have income below 30% of the area’s median family income – face the greatest barrier to obtaining an affordable apartment. For a single person, 30% of median family income would be an annual income of less than $17,100. It is people in this income group who seek help through our housing program. Click here for a data detailing income vs. rent costs and rent affordability, and compare the highlighted columns.